Ben Patridge (left) scored for Sutton Bridge United at Sawtry. The final scoreline of 4-1 was predictable, but the Peterborough & District League Rep XI bowed out of the Inter-League Cup with honour today (October 7). An away tie on the Isle of Man is about as hard as it gets for players at this level and after a long journey on the day of the game it was perhaps no surprise the local lads conceded a second-minute goal. The squad set off at 5.30am for a 6pm kick-off. Normally travelling from Peterborough to Moulton Harrox is seen as a grind of a journey. An early close range header set them back, but Darren Fogg’s squad responded quickly thanks to a fine finish from Scott Spearink of ICA Sports. Sadly two goals in quick succession gave the home side a 3-1 half-team lead which they extended to 4-1 soon after the re-start. Fears of a drubbing surfaced, but the PDFL side battled away on equal terms until the end. 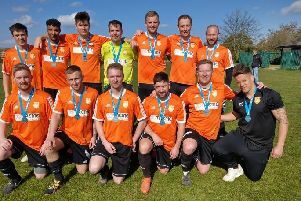 PDFL: Lea Jordan, Mark Oxenham, Chris Hansford, Kevin Holt, Kevin Brader, Callum Madigan, Gareth Knowles, Tom Flatters, Mark Baines, Aaron Dunmore, Joe Reed, Scott Spearink, Luke Ball, Jamie Darlow, Ryan Venters. Because of Rep XI commitments there was a truncated Premier Division programme, but Thorney extended their unbeaten run in the top flight to five matches with a 6-2 win over Holbeach United Reserves. Leon Gellizeau scored twice and Adam Scott claimed his 11th goal of the season to move clear at the top of the scoring charts. Sawtry came from 1-0 down and a man down to pip Sutton Bridge United 2-1 at Greenfields. Ben Partridge shot Sutton ahead at the break before Sawtry’s Nathan Smith was sent off. But Brian Smith and Shane Cooke scored for the 10-men to send Sawtry above their opponents into sixth place. There was more misery for bottom club Langtoft United who were well beaten 5-1 at Warboys. Scott Duncan and Jake Thornton both scored twice. Ketton made progress in the Leicestershire Senior Cup with a 2-1 win at Ellistown. Isle of Man 4, Peterborough League 1 (Spearink). Sawtry 2 (B. Smith, Cooke), Sutton Bridge United 1 (Patridge), Thorney 6 (Gellizeau 2, Scott, Retzlaff, Scott), Holbeach United Res 2; Warboys Town 5 (S. Duncan 2, Thornton 2, Moulds), Langtoft Utd 1.